Mal Reynolds: We’ll pass through it soon enough. 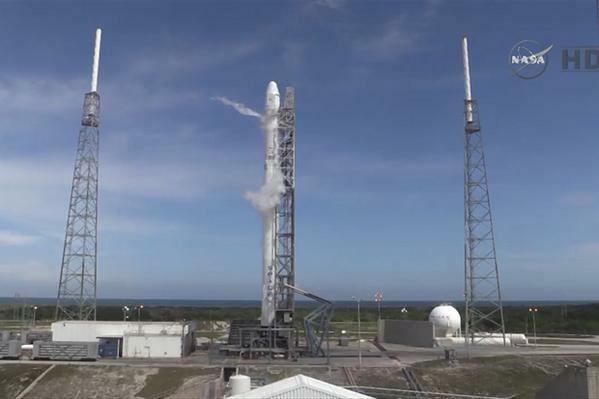 Today’s attempt by SpaceX to launch a Falcon 9 carrying a Dragon capsule to the International Space Station on the sixth commercial resupply mission to the ISS had to be scrubbed just a few minutes before liftoff because of weather concerns. Those who watched the launch attempt live online probably scratched their heads at the announcement, given the beautiful blue sky and white, fluffy clouds that served as the backdrop for the rocket as it sat on the launch pad. The real danger, however, was a front of dark, well-developed cumulonimbus “anvil” clouds that were within ten miles of the launch site. There were also some reports of distant lightning strikes within the ten-mile limit in the run-up to the launch window, and it is standard procedure to scrub a launch under such conditions. The next launch attempt will be tomorrow, Tuesday, April 14, just after 4:10pm EDT. In all fairness, though, tomorrow’s weather currently only looks to be 50% go for launch, whereas today’s was 60% just a short time before the scrub had to be called. And yet, the way we see it, there was a lot to feel positive about today. First of all, SpaceX was trending on Twitter just before the launch window again today. This is starting to become commonplace, which tells us that more people are starting to care about the work that NASA and SpaceX are doing, and are tuning in to watch launches as they happen. This simply cannot be a bad thing. We would love to see enthusiasm for space flight in this country return to the level that it had during the Apollo era, and though we’re realistic about the fact that it’s not going to happen overnight, the attention launches like these are getting on social media is as good a place to start as any. The Hero of Canton was all set to celebrate a successful launch at a SpaceX launch party, but in the end had to settle for raising a glass to the prospect of better weather tomorrow. We can’t help but wonder how Adam Baldwin would feel about having the chance to celebrate the launch of a Dragon named Serenity, and we certainly hope to find out someday soon! For the time being though, it’s all kinds of exciting to see that our Big Damn Heroes are starting to take notice of the ship that, if we have anything to say about it, will one day bear the name of the other “space freighter” that they helped make famous! And finally, it’s worth noting that United Launch Alliance, SpaceX’s chief rival in the competition to launch satellites for the US Air Force, announced today that they’ll name their new rocket “Vulcan.” When we learned of the announcement, we had to raise an eyebrow in honor of Leonard Nimoy, the recently deceased actor who played the most famous Vulcan in history. Despite its origins in Roman mythology, we refuse to accept that it’s just a coincidence that it’s also part of Star Trek, and while we’re not in the habit of looking to a SpaceX rival for inspiration in our quest to convince Elon Musk to name one of his company’s vehicles after a ship from our favorite science-fiction franchise, the influence that the popular science fiction continues to have in inspiring the real life space industry simply cannot be denied. We’re taking that as a good sign, regardless of the source, as we continue to dream of the day when we get to watch a manned Dragon named Serenity burn a bright arching path across the Florida sky as she breaks atmo with a crew bound for the ISS. Tomorrow will bring another opportunity for CRS-6 to launch, and for SpaceX to pull off their historic recovery of the Falcon 9’s first-stage booster rocket after she’s delivered Dragon into orbit. As usual, you can watch with us and the rest of the world online at nasa.gov and spacex.com.